Namely, in the case of stress, our sympathetic nervous system (SNS) flips on and activates the “fight-or-flight” response. Yet, in early human times, as people were constantly in danger, this response was vital to their survival, and the body systems normalized easier afterward. On the other hand, nowadays, we live in a stressful world that makes our fight-or-flight mechanism over-used, and thus damages our health. As soon as the SNS is activated, our body stimulates the production of a molecule called nuclear factor kappa B (NF-kB), that controls the way our genes are expressed. It turns on cytokines, the genes that make and release proteins, and this leads to inflammation, illness, and disease. However, this research showed that people who engage in these “Mind-body Interventions” (MBIs) such as yoga and meditation, show a significant decrease in the manufacture of both Nf-kB and inflammatory cytokines. This explains why we feel healed and protected from all kinds of health issues when practicing mindful practices. 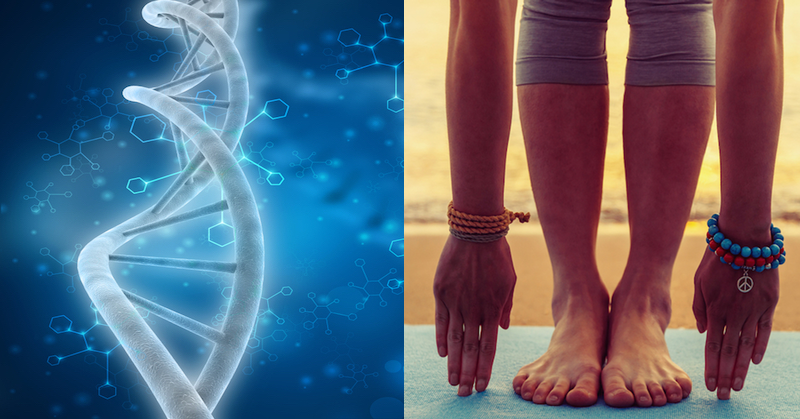 “Millions of people around the world already enjoy the health benefits of mind-body interventions like yoga or meditation, but what they perhaps don’t realize is that these benefits begin at a molecular level and can change the way our genetic code goes about its business. So, are you motivated enough to get started today?